Every fall, Daniel Dai gets together with several of his college friends for a potluck meal in California’s San Gabriel Valley, where the group catches up on their lives. Some of the young men have become fathers, “so we’re surrounded by kids,” Dai, now 31 and running his family's award-winning Vietnamese sandwich shop Banh Mi My-Tho, told NBC News. But it is the shared memory of a lost friend — not parties or graduation day — that binds this group of college friends. 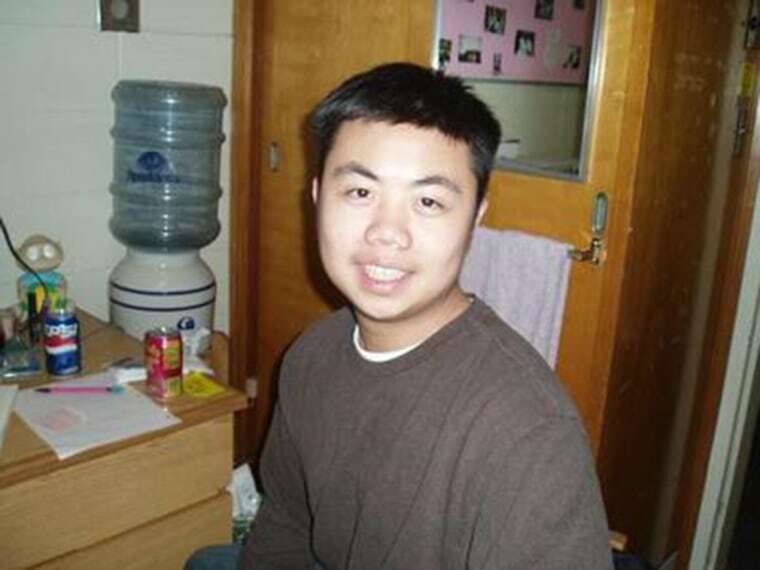 Ten years ago, Dai and his fellow students at California State Polytechnic University, Pomona pledged a fraternity at the University of California, Irvine that subjected them to physically abusive hazing and resulted in the death of their friend and classmate, Kenny Luong, of Rosemead, Calif.
Luong’s 2005 death bears similarities to the more recent hazing death of Baruch College student Chan Hsien (Michael) Deng, who died in 2013 after a fraternity ritual during a weekend retreat to Pennsylvania's Pocono Mountains. This fall, Pennsylvania prosecutors began bringing charges against 37 members of the fraternity, including third-degree murder charges, aggravated assault, and manslaughter. Luong and Deng were both children of immigrants — Vietnamese and Chinese, respectively — who pledged Asian-interest fraternities. In Deng’s case, the fraternity made blindfolded pledges carry sand-filled backpacks and run a gauntlet while fraternity brothers tackled them, according to police reports. Luong’s death came from injuries during a tackle football game in which Lambda Phi Epsilon fraternity brothers outnumbered the pledges and subjected them repeatedly to late hits and double-teaming, according to court documents. Both Deng's and Luong's cases featured allegations of fraternity members attempting to cover up the incidents. But the two cases differ in one crucial aspect: the fraternity members in California never faced criminal charges — not for hazing, much less assault or murder. Fraternity hazing deaths involving numerous possible assailants are difficult cases to pursue, experts say, and prosecutors sometimes shy away from them. Luong’s parents eventually found a measure of legal restitution by suing the fraternity successfully, but they faced obstacles along the way. For one, the national Lambda fraternity didn’t have insurance at the time of the incident, said the family’s attorney, Richard Cohn of Santa Ana, so the Luong family had to sue each fraternity member, resulting in a $1.7 million settlement in 2009 paid through the homeowners' insurance of the parents of each fraternity member involved. Luong’s family members were disappointed and confused by the lack of criminal charges, according to interviews after the incident. His mother Sophie and her family were said to be equally baffled about why her son would want to join a fraternity that made a practice of hurting pledges. “What kind of fraternity is this, trying to hurt the kids more than helping the kids?” Luong’s aunt, Yen Luong, said in an interview with the San Gabriel Tribune. To meet girls and make professional contacts: that’s why Luong and Dai wanted to form a fraternity at their school. But starting their own Lambda chapter required them to first pledge the existing chapter at UC Irvine, about an hour away. More than 10 weeks of pledging activities included grueling calisthenics sessions in which pledges were made to fall down head first with their hands behind their backs — also known as “chest dives” or “airplane” — that sent one pledge to the hospital for stitches in his chin. Other activities involved driving to Mexico to procure extraordinarily strong alcohol for the Lambda brothers, downing unhealthy amounts of water as punishments for trivial infractions, eating an onion, and assuming the “crucifix” position — that is, carrying a fellow pledge horizontally across one’s shoulders while kneeling on bricks for 15 minutes. The pledging activities culminated in an annual football game, which court documents reveal was no routine sports contest. One of the UCI Lambdas told lawyers that during a game years earlier when he was a pledge, he had broken his leg, another player received a concussion, and another had his arm broken. The Aug. 28, 2005 game drew more than twice as many UCI Lambdas and their alumni as the 10 or so pledges from Cal Poly Pomona. As the game started, the UCI team chanted, “Kill Pomona,” which the brothers later explained to police and attorneys as a team- and morale-building exercise. The game reportedly lasted three hours, with limited access to liquids and no protective padding to offset the brutal tackling that left Luong with clusters of bruises as large as 7 x 4 inches across his torso, upper arms and shoulder, an autopsy showed. After one tackle, Luong went down, and he didn’t get back up. No action was taken at first, until the severity of Luong’s condition became obvious. According to court documents, news reports at the time, and recent witness interviews, Luong was spitting out mucous and in a state of seizure. Dai said panicked players were shouting, “Kenny, wake up." One of the pledges telephoned Luong’s parents and urged them to come to the hospital right away. His father, Tony Luong, arrived in his work uniform as a casino dealer, and his mother Sophie rushed in from home. Luong’s brain had swelled so much that doctors drilled holes in his skull to try to relieve the pressure, but he never recovered. At UCI, the Lambdas were an off-campus fraternity: recognized by, but not part of, the university. After Luong’s death, UCI put the group on emergency suspension and later revoked their recognition. But the UCI Lambdas weren’t going anywhere. They continued to function informally and even accepted a pledge class in 2006. No, the UCI Lambda answered: “We didn’t feel we had done anything wrong." Efforts to reach the UCI Lambdas involved in the 2005 incident were unsuccessful. The national office of the fraternity did not respond to efforts to contact them for this article. At Cal Poly, meanwhile, Dai and the other pledges abandoned the fraternity quest. They responded to their grief in different ways, including one pledge who appeared to vanish for awhile, telling friends he needed to be alone. As for Dai, he lost his academic ambitions and dropped out of college, concentrating instead on running his family’s sandwich shop in Alhambra. If Luong hadn’t died and the pledges had been able to launch their own fraternity chapter, he believes, his life might have taken a different turn. William Luong, who was not related to Kenny but had been his roommate and fellow Lambda pledge, told NBC News he needed more than a year after his friend’s death to revive his grades, which had fallen during pledging and its aftermath. He graduated and now works as an engineer in Arizona. Luong recalled Kenny as a "great listener and a caring person" who liked fast cars, video games, and cooking. Kenny relied on a jar of secret spices from celebrity chef Emeril, Luong said, and would exclaim Emeril's signature "bam!" whenever he used it. Following his friend’s death, William Luong grew close to Kenny’s mother Sophie, who was dying of cancer and heartbroken over her son. First she lost her hair, he recalls, then her sight and finally her awareness of who people were. But she always remembered William. Four years after Luong was a pallbearer at his friend Kenny’s funeral, he served in the same capacity for Sophie, whom he’d called “Auntie.” It was a bittersweet honor, considering how responsible he felt for her son’s death. Over the years, Luong has faithfully visited the graves of mother and son. They are buried in the same spot, one directly over the other.